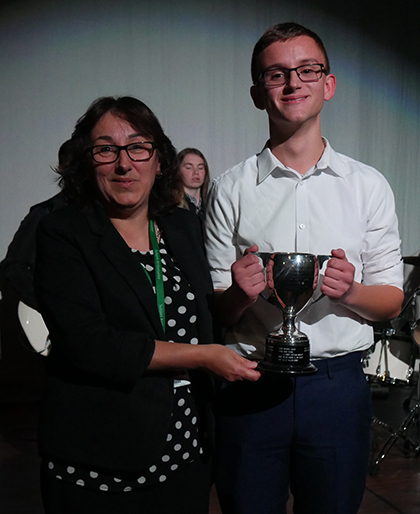 A talented musician wowed audience and judges alike at the Heartfield-Wharam Scholarship Concert at The Sixth Form College, Solihull this week to win a bursary prize. A total of 10 gifted Music students put themselves through a nerve-jangling audition in front of an audience of staff, students and parents to win a scholarship fund at the first concert of the academic year. Solo performances ranging from vocal pieces to instrumental pieces on the piano, guitar, violin and flute made up the first half of the concert, with Music staff judging the winner. Lukas Evans (aged 17, from Solihull) was judged to be the winner. He performed the 1st Movement of the Violin Concerto in G Major by Haydn to claim the prize. The £150 bursary is to spend on music tuition from an eminent performer of his choice. The bursary was set up in memory of two great musicians who strongly supported music in Solihull and at the College. Roy Heartfield was the original Head of Music at the College, who died in post in 1992, while Margaret Wharam was the former Head of Music at Malvern Hall and Head Organist at Solihull Methodist Church. The first winner of this prize was in 1994 and for the last 20 years the scholarship fund has continued. See more photos from the Concert on our Facebook page. The next music concert at the College will come in December. The Christmas Concert takes place at 7.00pm on Wednesday 14 December. Anyone interested in getting tickets is asked to call 0121 704 2581 or email marketing@solihullsfc.ac.uk.